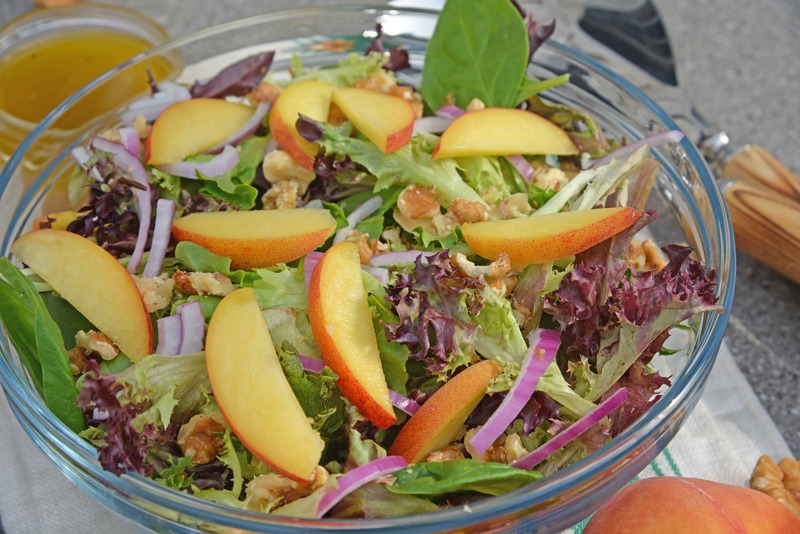 Peach Salad is a sweet and savory salad with a tangy homemade salad dressing. 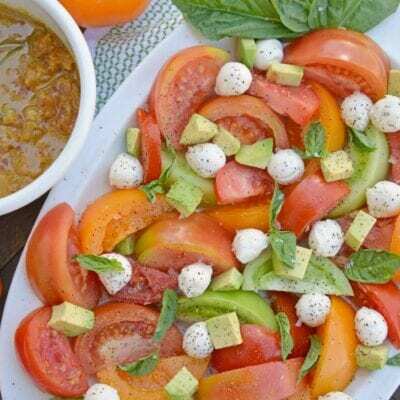 The perfect summer salad for the hot months. 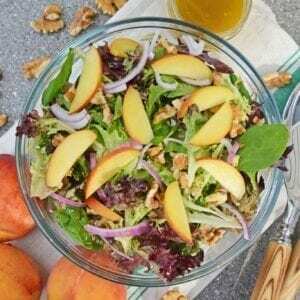 Peach Salad is a scrumptious summer salad filled with delicious peaches, gorgonzola cheese, shallots, candied walnuts and a tangy peach salad dressing. A new take on fruit salad. First, let me say, I realize it is not yet peach season, but I made this salad last summer and have been waiting to post it all winter! I got backed up and by the time it was ready to post it was well beyond peach season. The good news is that even if you want to make this salad off season, you can use canned peaches instead of fresh peaches. Make sure you PIN Peach Salad! But now I am obsessing over the sweet smell and juicy flesh of a delicious fresh peach. What I would give for one right now!!!! So here is the story: I bought Gorgonzola cheese and peaches galore to experiment with making Peach and Gorgonzola Pizza, but was then left with a half a brick of Gorgonzola cheese and 2 large peaches. 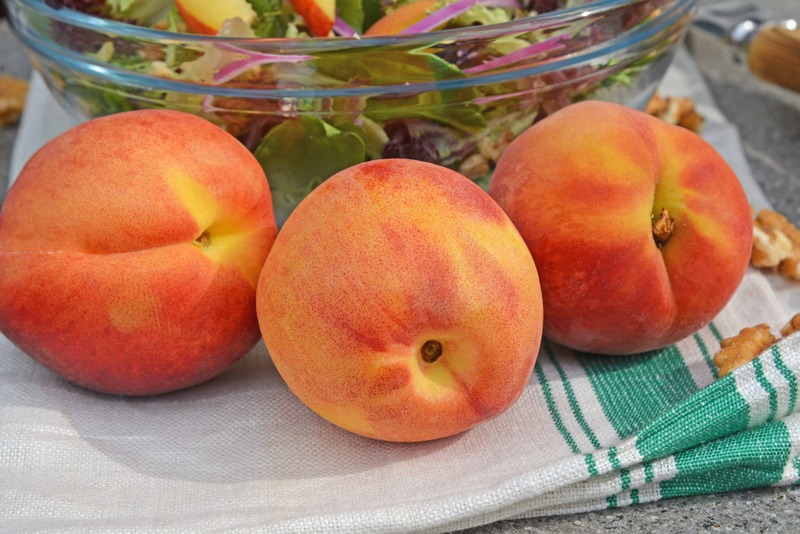 PEACH FACT: There are 300+ varieties of peaches, so changes the type of peach you use will change the flavor profile of the whole salad. Gorgonzola salad is all the rage right now, but the peaches ended up stealing the show, so now it is a peach salad. What to do, what to do…. MAKE PEACH SALAD! I also had leftover candied walnuts from Apple Pie French Toast and some champagne vinegar from a smashing salad dressing I made the night before. Sometimes recipes developed out of all the little leftover pieces are the best. Peach Salad was basically making itself at this point. This recipe works great as summer salads go. A light salad, but full of flavor, not your boring regular salad. It is actually refreshing. Serve with a glass of iced tea for the ideal summer lunch. What is champagne vinegar? Like white wine vinegar, it is derived from wine (sparkling in this case) and is lower in acidity with a milder flavor than other vinegars. This makes it ideal for salad dressings seeing it adds flavor and bite without being overwhelming. ONE. If you can buy local, do! Local peaches don’t travel as far and are thus, fresher. It is scientifically proven that fruits and vegetables start to lose nutritional potency the moment they are picked, so these will also pack the most nutrient punch. TWO. Taste test! 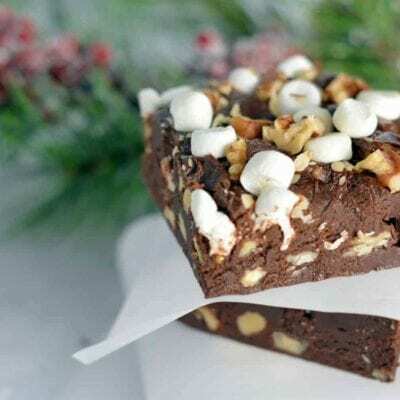 Chances are if you are buying local at a produce stand or farmer’s market, they will be happy to give a sample slice. THREE. Smell it! A fragrant peach is a good peach. FOUR. Look for color. Vibrantly colored peaches tend to have the best and most robust flavor. Shy away from peaches with any strains of green. FIVE. Give it a good squeeze. Peaches get juicier as they ripen. Using two fingers, give it a little squeeze near the stem and if it starts to give with a little resistance, it is good to go. Avoid overly mushy or overly hard peaches. SIX. Avoid bruising. Carry your peaches likes they are eggs…. carefully. 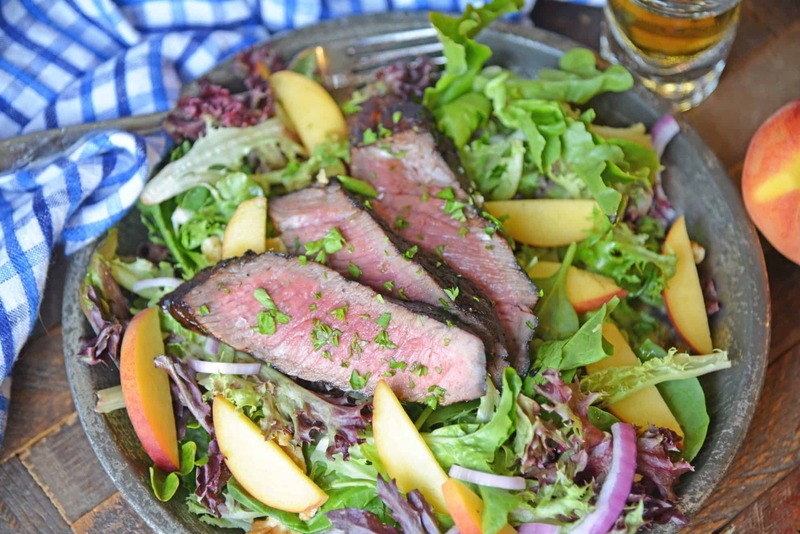 This salad also pairs nicely with my Balsamic Whiskey Sirloin to make it an entree. Before you get chopping, make sure to check out my 7 Tips for Better Salads! – I used to not use one, but having dry lettuce is a game changer! – I make all my own salad dressing from scratch. I love that I can change the flavors every week depending on what I have around the house. Making it and storing in a dressing shaker is so easy! Can I use canned peaches instead of fresh peaches? Canned peaches can be substituted for fresh peaches, but an even better option is frozen peach slices. If you do use canned peaches, make sure they are packed in juice and not syrup and then drain them well. Can I make peach salad ahead of time? You can make the salad, peach salad dressing and candied walnuts ahead of time, but don’t actually dress the salad until you are ready to serve. What can I substitute for peach preserves? You can also use chopped up fresh peaches or canned peaches. 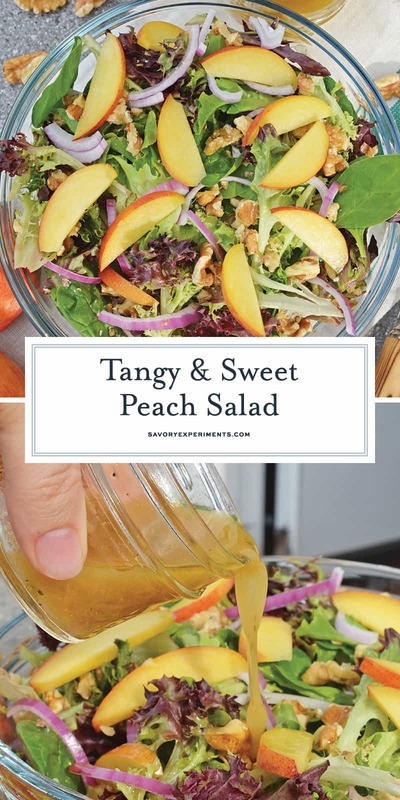 If can also omit the peaches altogether, but it will just be a vinaigrette instead of a peach salad dressing. What can I substitute for champagne vinegar dressing? You can use any type of vinegar you want. A white wine vinegar would be the best though. Can I use grilled peaches? You sure can! Grilling peaches uses their natural sugars to caramelize the outside, adds smokey flavor and of course, variation in temperature. You can find more on how to grill peaches here. I don’t like peach skin, can I peel my peaches? Yep! Here are easy instructions on how to peel a peach! 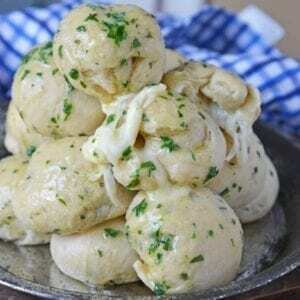 What can I substitute for gorgonzola cheese? Blue cheese is an excellent substitute, but also goat cheese or another soft, crumbly cheese. You can also just omit the cheese. Can I use another type of fruit? Any stonefruit will work well in this salad. 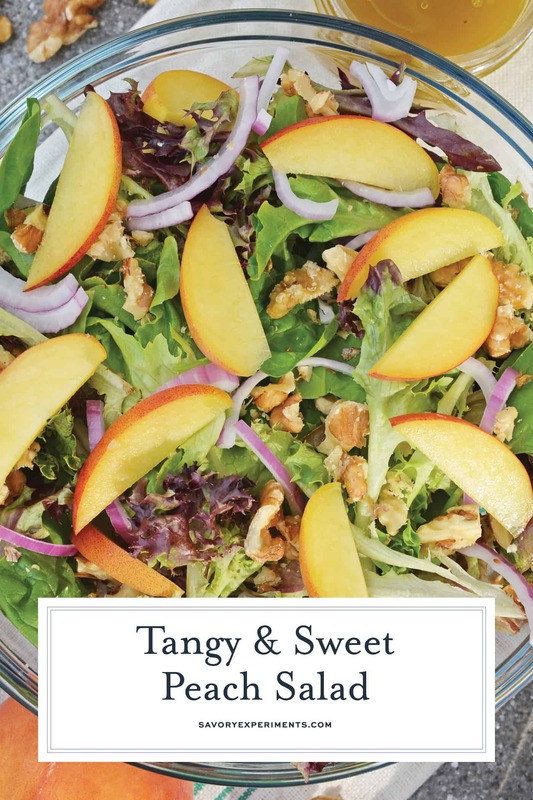 Peach Salad is a scrumptious summer salad filled with delicious peaches, gorgonzola cheese, shallots, candied walnuts and a tangy peach dressing. The perfect summer salad! Begin by candying your walnuts. Melt butter in a medium skillet over medium heat. Add walnuts and brown sugar, mixing continuously until walnuts are covered and sugar is melted. Place a sheet of wax paper on a plate, coat lightly with cooking spray and lay walnuts in a single layer. Sprinkle lightly with fine sea salt. Set aside and allow to cool. Heat oven to high broil. Lay peach slices in a single layer and place under the broiler. Watch carefully and remove when peaches start to sizzle and brown, approximately 5-8 minutes. Wash lettuce and dry well. Toss into a large serving bowl. 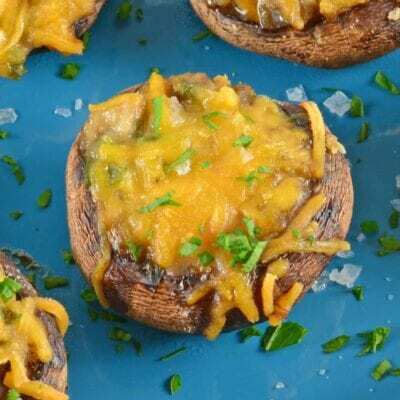 Top with Gorgonzola cheese and shallots. Combine Dijon mustard through freshly ground black pepper in an airtight container and shake, shake, shake until mixed. Add lettuce and toss well. Lastly, and right before serving, add peach slices and candied walnuts. 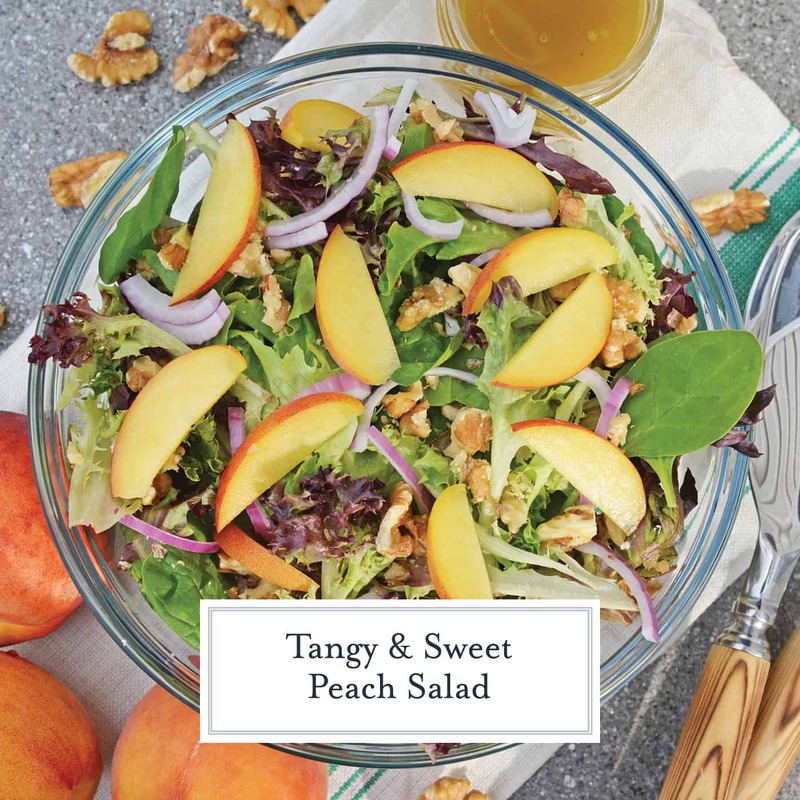 Enjoy your Peach and Gorgonzola Salad with Tangy Peach Dressing! G’day! Looks great! Congrats for also being featured in the Olive and Grapevine weekly! My favorite fruit to put in salads are strawberries. This salad looks amazing! I am a huge fan of peaches! Looks like a yummy salad, I’m not sure about the fruit and cheese combination though. However, I do love peaches! Oh, it is a divine mixture- the sweet fruit and tart, smelly cheese compliment each other well. This looks so sweet and savory! And that peach dressing sounds delightful! 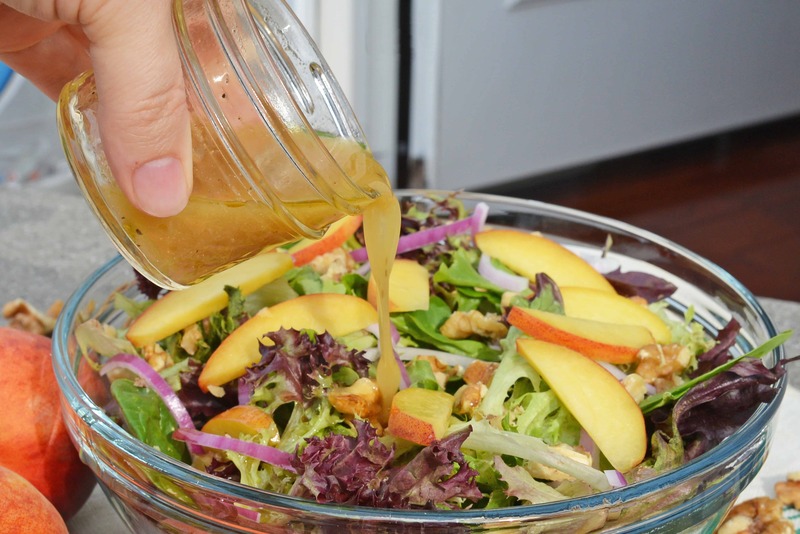 The dressing can be used a variety of salads or grilled vegetables. Wow, peach dressing sounds fantastic! So bright and cheery! I’ve never thought to put peach in my salad. You’re pretty stinkin’ brilliant. This looks fabulous! Hahaha! I loved spending time with you as well! I love knowing the blogger I am reading, I can hear their voice and personality in the post. This looks delicious for summer! I bet a peach dressing is sooo good! This sounds amazing! A perfect summer salad! This salad sounds interesting! I would love to try it. That looks delicious. Would you believe I’ve never tried gorgonzola cheese before? Really? It isn’t everyone’s cup of tea, but worth trying! This looks like a really refreshing salad! I love adding fruit! I’m in! I’m up for any recipe that calls for gorgonzola. Thanks for this delicious sounding dressing recipe. I’m always looking for new salad dressings to try. This one looks and sounds like it would be really good, especially to enjoy during these warm spring months. This looks delicious. I love trying all types of salads, and I especially love Gorgonzola cheese. This salad looks delightful. I’ll have to try this recipe some time. I’ve never heard of peach dressing before. That might be a dressing that I’d actually like. 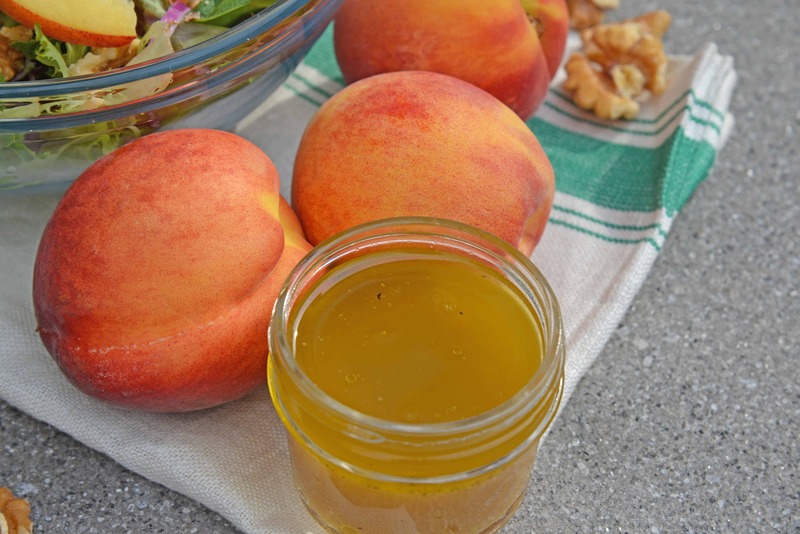 I’m a big fan of peaches, so this dressing and salad are right up my alley. I’d have to add some sunflower seeds, though, if I expected Hubs to eat it. Sunflower seeds would be an excellent addition- give it some crunch! This sounds super delicious! What a great combination! I love that it has Goronzola. I usually halve the amount recommended because I love it, but I love just a hint of it! This salad looks terrific! 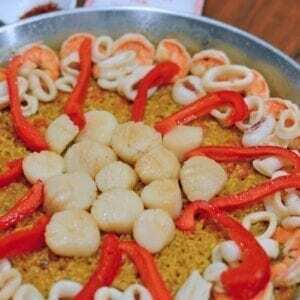 OMG this looks delish! I printed it out to try this weekend. Thank you! That looks delicious! I like the idea of a peach dressing! Okay, THIS is going to be pinned and a note is going to be written detailing how much I NEED this salad in my life! I love a fresh salad like this especially during the Summer time. It’s a great way to cool off! SOLD! I love gorgonzola cheese with pears too! This salad sounds super tasty. This looks so yummy! I love adding blueberries to salads. I’ve never thought to add peaches, but I like that idea. Oh this looks delicious. I usually put cranberries and apples on a salad. Sometimes strawberries. I love the idea of peaches, though. Wow, that’s a lot of peach! 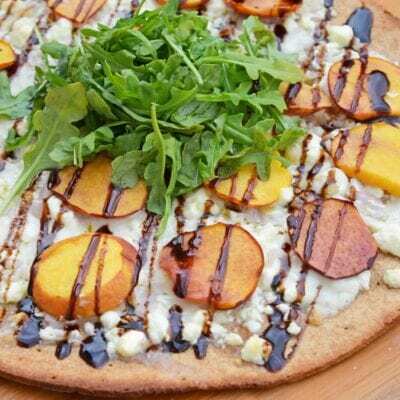 I love the idea of gorgonzola in this, I’ll bet it is delicious with the peach! MM. Fruit and Cheese – my two favorite thing to go in/on a salad! I’m not a fan of cheese on my salad, but I think it would stand fabulously without it. This sounds good. I’ve never purchased champagne vinegar before, but I’m feeling inspired.